Love is the cure for everything. Zongzi's journey help me to get through depression. I hope it can help others. My brother committed suicide soon after his wife. Too many of my friends took this way out. Once someone came up to me and said "Wow Rick when I first heard that a Sentieri killed himself I thought it was you." Please do not ever say that to some one! If you are suffering from depression or know some one who is PLEASE give them a copy of ZONGZI's Journey. This is why I wrote the book to help people to get through the darkest of moments. 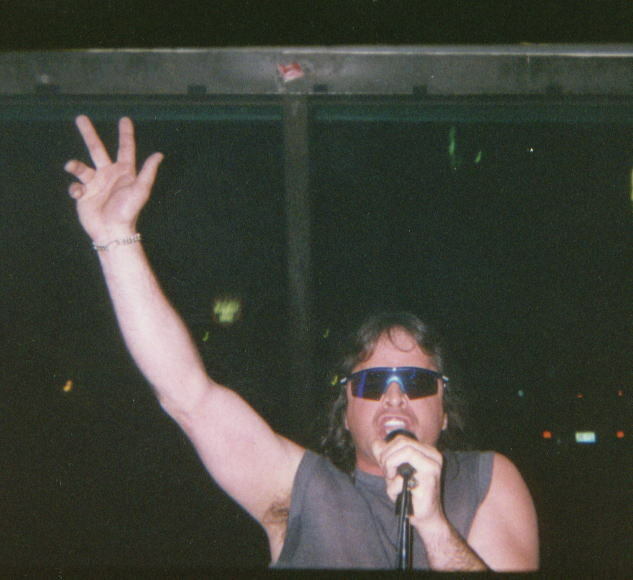 Singing at "The Loft" during the "DEUCE-EX BoiNK THE REST" TOUR "97"
This night Rick seemed to come from right of the darkness SCREAMING like a madman! At this show Rick's pants kept falling down because of a button on his pants that had popped off! This show was not one of Duece-Ex's better shows. Just before the start of the show they decided to use the back-up drummer. The original drummer Rick was too hung over from the previous show the band did the night before. The stand-by drummer, Lisa, did a great job keeping the beat. But before the band could play the Rhodes had to clean out a stage area inside a broken down barn. During the show there was a power shortage and they had to use the battery out of the equipment van to power the Momma Death Light. Then latter on after the performance, while playing his harmonica, Rick fell through the floor of the hayloft and onto the banquet table full of food! Rick also cut his lip on his harmonica, slipped in manure and through-up on himself. Then after coming home from the show Rick had to go right back because he could not find his wallet. Luckily the wallet was found by the hole in the attic's ceiling. The Rhodes spilt the money that the band was paid because of all the work they had to do in building the stage and putting up the light show. The finger flipping taco and the "Orange Pumpkin" the Duece Ex 2nd equipment van. 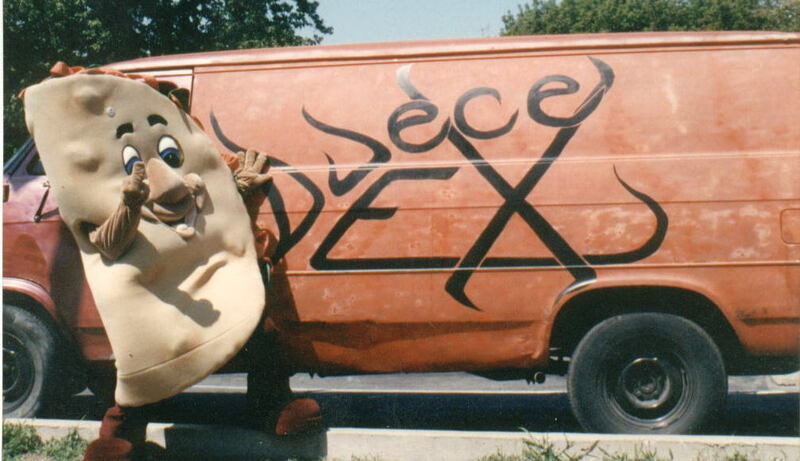 This van was also painted by the Rhodes and Rick the drummer agian painted the Duece-Ex logo. During this time Duece-Ex was more into winning softball games. The pumpkin van's main job was to transport the softball team to and from games. One of the this vans biggest highlights was when it actually got into a softball game. The pumpkin van got to pinch hit for a injured player. The bases were loaded in the bottom of ninth inning and the van got hit by the pitch forcing in the game winning run. "We just stuck a baseball bat into the great Pumpkin's front grill and let it's magic do the rest!" said the team manager John We Willie Wilson. This van can be seen at the Smithsonian Institute alongside the wax replicas of the Duece Ex softball team!